So le Pistolero won't be joining the Tour 2011, at least that's what the word on the street says. Many have been saying that "alright, the game is over, just give Andy Schleck the prize and the jersey now and we can focus on other races". I reckon most of these are remarks for just for fun, although some I'm not that sure about. Many will see this as their one-time chance to win or podium in the Tour. The Tour's best rider, with or without clenbuterol, is out at least for a year. Maybe more if Pat McQuaid and the rest of the UCI and/or WADA get their will. - Vande Velde, the unlucky American. Hope he stays on his bike longer this year. - Gesink is finally out of Menchov's shadow and can probably do better that 10th last year. - Rodriguez if he decides to give it a go, will be great to watch on those shorter steep ascents, probably he'll have Gilbert on his tale on those. So I don't think AC's absence will be crucial. 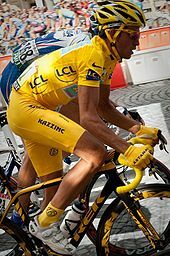 I said before on a blog post that cycling is bigger than Lance Armstrong, and the same goes for Alberto. Things can be exciting without the promised match between AC and Andy Schleck. I believe the Tour of 2011 will be one to remember, many riders will give their best this year, and the competitors' seen together are more alike than I can remember. That's just for the GC, new rules for point competition will take it to the next level as well. What a great show it will be. Be quick to order hotels if you haven't done it already, it's getting difficult to get a good spot. Or bring a tent, that always work.